Canal: Canal+ UHD is now encrypted in Nagravision 3 (12324.00MHz, pol.V SR:29700 FEC:2/3 SID:8603 PID:310[H.265] /321 French,322 qaa,323 Audio Description). 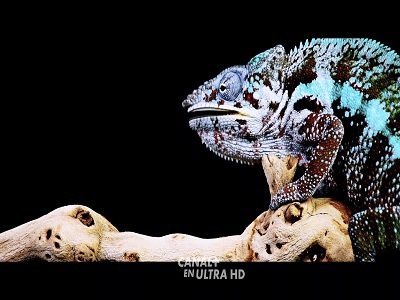 Canal: Canal+ UHD (France) is now transmitted Free To Air (12324.00MHz, pol.V SR:29700 FEC:2/3 SID:8603 PID:310[H.265] /321 French,322 qaa,323 Audio Description). New frequency for Canal+ UHD: 12581.00MHz, pol.V (DVB-S2 SR:22000 FEC:2/3 SID:1002 PID:210[H.265] /221 French- Clear). Canal: Canal+ UHD is encrypted again after being temporarily unencrypted on 12324.00MHz, pol.V SR:29700 FEC:2/3 SID:8603 PID:310[H.265] /321 French (Nagravision 3). Canal: Canal+ UHD (France) is now transmitted Free To Air (12324.00MHz, pol.V SR:29700 FEC:2/3 SID:8603 PID:310[H.265] /321 French). Canal: New frequency for Canal+ UHD: 12324.00MHz, pol.V (DVB-S2 SR:29700 FEC:2/3 SID:8604 PID:410[H.265] /421 French- Clear). Canal: New frequency for Canal+ UHD: 12324.00MHz, pol.V (DVB-S2 SR:29700 FEC:2/3 SID:8603 PID:310[H.265] /321 French- Clear). Canal+ UHD is encrypted again after being temporarily unencrypted on 12581.00MHz, pol.V SR:22000 FEC:2/3 SID:1001 PID:110[H.265] /121 French (Nagravision 3). Canal+ UHD (France) is now transmitted Free To Air (12581.00MHz, pol.V SR:22000 FEC:2/3 SID:1001 PID:110[H.265]/121 ). Canal+ UHD is now encrypted in Nagravision 3 (12581.00MHz, pol.V SR:22000 FEC:2/3 SID:1001 PID:110[H.265]/121 ). Canal+ UHD is back on 12581.00MHz, pol.V SR:22000 FEC:2/3 SID:1001 after a break ( PID:110[H.265]/121 - Clear). Canal+ UHD has left 12581.00MHz, pol.V (DVB-S2 SID:1001 PID:110[H.265]/121 French), it is no longer transmitted by satellite in Europe. New SID for Canal+ UHD on 12581.00MHz, pol.V FEC:2/3 SR:22000: SID:1001 ( PID:110[H.265]/121 French - Clear). Canal+ UHD is back on 12581.00MHz, pol.V SR:22000 FEC:2/3 SID:6401 after a break ( PID:110[H.265]/121 French - Clear). Canal+ UHD has left 11479.00MHz, pol.V (DVB-S2 SID:6401 PID:110[H.265] /121 aac French), it is no longer transmitted by satellite in Europe. Canal+ UHD (France) is now transmitted Free To Air (11479.00MHz, pol.V SR:22000 FEC:2/3 SID:6401 PID:110[H.265] /121 aac French). Canal+ UHD (France) broadcasts in DVB-S2 Nagravision 3 on 11479.00MHz, pol.V SR:22000 FEC:2/3 SID:6401 PID:110[H.265] /121 aac French. Canal: Canal+ UHD has left 11479.00MHz, pol.V (DVB-S2 SID:6401 PID:110[H.265] /121 French), it is no longer transmitted by satellite in Europe. Canal: Canal+ UHD is testing in DVB-S2 Nagravision 3 on 11479.00MHz, pol.V SR:22000 FEC:2/3 SID:6401 PID:110[H.265] /121 French.